Progress and outcomes: The original idea for the World Parrot Trust buses came from Paul Butler of RARE Conservation, who asked if the Trust could provide a parrot bus for the Caribbean island of St. Lucia. The Trust provided the Jaquot Express, which was to travel all over the island visiting schools and other locations and telling the story of the endangered St. Lucia parrot (Amazona versicolor) and what had to be done to save it from extinction. St. Lucia Amazon populations have been affected by the loss of crucial breeding areas over the island. The team at Paradise Park, led by David Woolcock and Nick Reynolds, bought a used bus and fitted it out with working models, video programmes and other educational aids, then shipped it out on a banana boat and handed it over to staff of the island's forestry department. 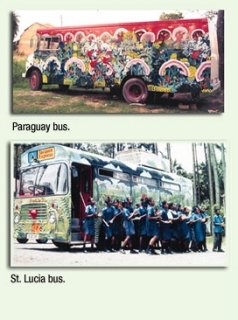 It was a great success, and resulted in similar buses being provided for the neighbouring islands of Dominica and St. Vincent for the Red-necked and St. Vincent Amazons, and also for use in Paraguay in South America. This remarkable achievement resulted in Paradise Park and the World Parrot Trust being chosen by BBC Wildlife Magazine as winners of the 'Zoo Conservation Award for Excellence'. Sorry, there is no multimedia for this project.